They folks over at DasKeyboard loaned me a reviewers copy of their totally blank keyboard about three weeks ago and I've been typing on it since. Sure it's blank, and at cursory glance, that's a gimmick. But DasKeyboard claims to have individually weighted keys. 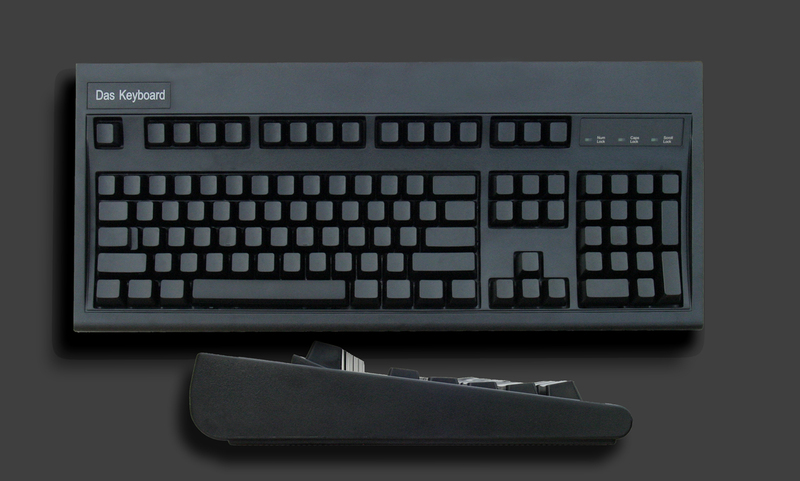 Most keyboards have keys weighted at 55 grams of force - that's how hard you have to push. 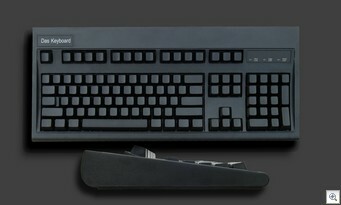 DasKeyboard has 5 different levels of force from 35 grams to 80 grams lined up with the varying strength of your fingers. I know that my pinky fingers do tend to hurt more than the primary fingers. There's a 30-day guarantee, and they are currently on sale for $70. It's a smidge spendy - I'd pay no more than $50 myself, but +/-$20 it's a very nice feeling keyboard. The key travel is smooth and comfortable. Be aware, it uses a legacy-free USB interface, so no old-style keyboard interface here, but that shouldn't be a problem for a computer purchased this century. I'm still having trouble with the [ ] bracket keys and a few other programmer specific symbols, but my prose typing has definitely improved in speed. When I go home now after using DasKeyboad for just under a month I don't have to look at my fingers at all. My wife likes it also as she's been trying to become a touch typer. Another benefit for blank keys is easy switching between Dvorak and Qwerty keyboard layout. I've tried to switch twice and failed. One day I'll try again, probably with a blank keyboard. I know at least one co-worker who types Dvorak on a Qwerty keyboard. I'm not sure how he ignores the Qwerty lettering. There are a few competitors out there like the Happy Hacking Keyboard that includes no cursor keys, but none have the individually weighted keys. I'm very sorry to see my reviewer keyboard go back in the mail this week. If you're interested in typing faster, you're having finger fatigue, or you just would like a nice, classic keyboard with the added benefit of smoother, individually weighted keys and a nice key throw, you should check out DasKeyboard. You'll get my Microsoft Natural Ergonomic 4000 when you pry it out of my cold, dead, anemic t-rex programmer arms. "I know at least one co-worker who types Dvorak on a Qwerty keyboard. I'm not sure how he ignores the Qwerty lettering." It's called touch typing. Actually, when I started out, I had a beige keyboard that I wrote the new keys on. Then I made severe use of the Mavis Beacon typing tutor. I was slowed down for a week or two. Now, if I have to use a QWERTY arrangement, I feel it in my wrists pretty quickly. Bah. Go buy yourselve one of the Microsoft Comfort Curve 2000 Keyboards. Item# B2L-00047. Newegg has them with a Optical Mouse for $24.99 + Shipping. Best keyboard, ever. Light to the touch. Slight ergonomic bend. Insert/Home/Delete/End in the classic 2x3 layout. No more 'f' key to toggle the 'function' keys to F1-F12 mode. Run, don't walk, and get one now! I can second the recommendation of the Mavis Beacon Teaches Typing. Note however that you'll need to get version 5 of the program -- newer versions have removed the support for Dvorak. If you type at a regular keyboard, then switching to a natural (i.e. curved) keyboard may be a nice way to reprogram your brain; that's how I did it, and now I'm able to touch-type Dvorak on a natural keyboard and Qwerty on a regular keyboard!